Where: On the left-hand side of any road. 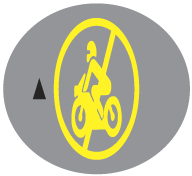 Purpose: To indicate the limits within which only cyclists may travel. Action: Do no drive in the demarcated area. Where: At traffic circles and mini-circles. Purpose: To indicate the direction you must follow around the circle or mini-circle. Action: Only drive around the circle in the direction indicated by the arrows. Yield to traffic coming from your right hand side. 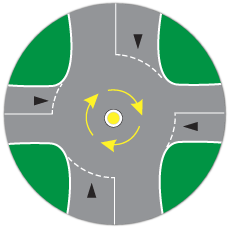 At a mini-circle yield to traffic that reaches their yield line first before you reach yours. Drive slowly so that you can stop if someone does not yield.